The Produce Hall in Stockport has opened its doors following a complete transformation into a food hall. 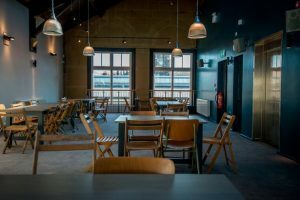 The Grade II listed building which faces the historical indoor market will have a number of food traders operating within it plus a bar serving local craft beers. Restaurateur Steve Pilling is behind the project and has a long standing relationship with the building, having visited with his mother as a child for cheese and onion pies and plates of tripe. Original beams and pillars have been exposed and painted in dark grey and a rich red with teal and yellow tiling at each food station. 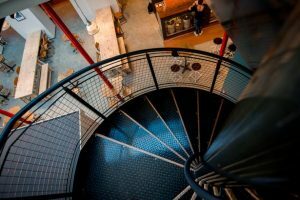 A mezzanine level upstairs, accessed via a black and brass spiral staircase, contains further seating and has views over the rooftops of Market Place. It is a simple fit out with mismatched wooden furniture, low hanging lighting and white walls displaying a smattering of local artwork. 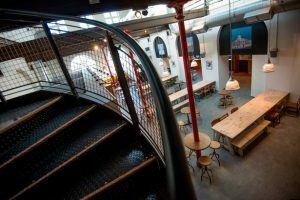 The Produce Hall opened its doors on the 2nd April and ten food traders will start service including Black Market Expresso Co, Oh My Cod, Poco Mas, Neighbouring Brood, Pie-curious, Fat Louis and Foccaine. 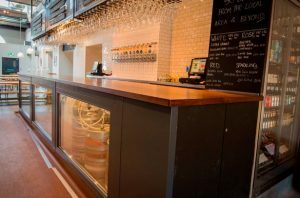 A minimalist bar displays the beers on offer and there is a concise range of wines and fizz. Outside will be seating with patio heaters and umbrellas connecting with neighbouring Project 53 and Bakers Vaults to create a strip of pavement side drinking and dining.